Cherry Galette with Homemade Whipped Cream and Almond Flakes - Let the Baking Begin! As the ‘U-pick’ season starts you will find me or my family picking all kinds of delicious fruits and vegetables. Right now it’s cherry picking season, so I got a whole bunch of cherries that I have eaten fresh until my belly hurts, canned into mason jars for future cherry endeavors and baked into delicious pastries to be enjoyed right now. Galettes were the first thing that came to my mind when I was thinking of something I could use the cherries in. I like how rustic and imperfect they look, giving each galette it’s individuality and uniqueness. Perfection is not something I was striving for this time. Eating this galette warm with some ice cream or cold with some whipped cream is amazing! I had no ice cream at the time so I used whipped cream, but I do think that the ice cream was the true match for this galette. You can also choose to make French Almond Cream to put underneath the cherries, which of course will make this galette all the more amazing, but it’s not necessary. The cherries and crust is all that’s needed. Combine the cherries and sugar in a bowl. If pressed for time let sit for 10 minutes, then drain the juice and use the cherries for filling. For best results leave the cherries and sugar covered in the fridge overnight. 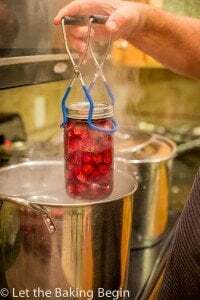 The water will be drawn out of the cherries and they will not ooze as much juice when baking. In a food processor combine cold cubed butter with all purpose flour, sugar, salt and baking powder until crumbly (alternatively, on a flat working surface place the flour, sugar, salt and baking powder, then add the butter and keep cutting together with a knife until small pea-size pieces form). Add the egg yolks, sour cream and the vanilla extract and continue processing until the dough comes together. Press it together into a ball. Cover with plastic wrap and press into a disc. Chill in the fridge for at least 1 hour, but for best results chill for several hours or overnight. The longer the dough is chilled the less it tears as you roll it. The dough can be stored in the fridge for up to 1 week. Bring to room temperature before rolling out. Divide the dough in half and roll it out on a well floured surface to about 1/4 or even 1/6 of an inch. The dough you see on the pictures was refrigerated overnight and therefore is very pliable. Cut out 5-6 inch circles for mini galettes. 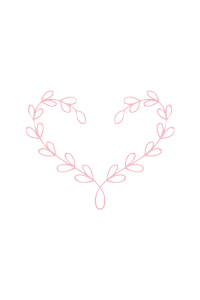 Collect the scraps around the cutout circles and roll it out again, then cut out more circles out of it. Transfer the circles to a parchment paper lined baking sheet (or foil) for easier cleanup and removal. 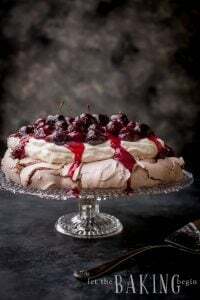 If using the French Almond Cream underneath the cherries, spoon a dollop in the middle of the cutout circle, then top with about 1 heaping tablespoon of well drained cherries. Collect the edges of the dough towards the center, sticking each fold to the previous one. The better you press them, the better they will hold during baking. I didn’t press them well enough so most of the opened during baking. Brush the dough part of the galette with egg wash, sprinkle with granulated sugar and some almond slices. To make a large more rustic looking galette, just roll the dough out into a circle, (If using the French Almond Cream underneath the cherries, spoon the cream in the middle of the circle before putting the cherries on top) fill with cherries and then fold towards the center. Press each fold firmly to prevent the galette from loosing it’s shape while baking. Brush with egg wash, sprinkle with sugar & almond slices. Bake in a preheated to 375F oven for about 15-25 minutes, or until golden in color. As soon as you remove it from the oven brush on the warm jam onto the cherries (this is optional). Serve as is, or with some homemade whipped cream. If serving warm, you can add a scoop of vanilla ice-cream. 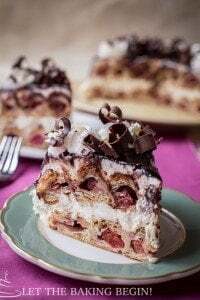 Plum Butter Pirog – Cookie with roasted almonds and meringue. Plum Tart Recipe – The best tart with almond cream. French Almond Cream & Pear Tart – Tart filled with pears, almonds, and almond cream. In a food processor combine cold cubed butter with all purpose flour, sugar, salt and baking powder until crumbly (alternatively, on a flat working surface place the flour, sugar, salt and baking powder, then add the butter and keep cutting together with a knife until small pea-size pieces form). Add the egg yolks, sour cream and the vanilla extract and continue processing until the dough comes together. Press it together into a ball. Cover with plastic wrap and press into a disc. Chill in the fridge for at least 1 hour, but for best results chill for several hours or overnight. The longer the dough is chilled the less it tears as you roll it. Bring to room temperature before rolling out. Divide the dough in half and roll it out on a well floured surface to about 1/4 or even 1/6 of an inch. 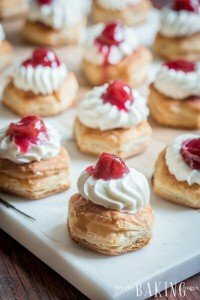 Roll the dough out into a circle, (If using the French Almond Cream underneath the cherries, spoon the cream in the middle of the circle before putting the cherries on top) fill with cherries and then fold towards the center. Press each fold firmly to prevent the galette from loosing it’s shape while baking. Brush with egg wash, sprinkle with sugar & almond slices. Bake in a preheated to 375F oven for about 15-25 minutes, or until golden in color. As soon as you remove it from the oven brush on the warm jam onto the cherries (this is optional). With a whisk or mixer, whip together heavy whipping cream, sugar and vanilla extract until soft and fluffy, but holds shape. I made the dough last night and am wondering if it is supposed to be as hard as mine was. I followed your recipe exactly, but finally had to take everything out of food processor and work it with my hands because it seemed like there was too much flour and not enough wet ingredients. It was extremely hard to work with and I ended up having to add an extra yolk just so I can work in the dry ingredients with the wet. I took out the dough this morning and seems like it’s getting a little softer and more workable but it’s still pretty tough. Is this how it’s supposed to be? Any suggestions? Yes the dough is supposed to be crumbly and barely coming together when you take it out of the food processor. The moisture needs time to soak in the flour and then it should be pretty pliable. Put it in the fridge, leave it overnight if you can, then bring it to room temperature and you will see that it is very easy to work with; unless you scooped the flour with the measuring cup and then it it might’ve packed in too much flour for the amount of moisture, but I think it should be ok when you bring it to room temperature. Sorry for taking this long to reply, I am at the beach and there’s barely any reception at all. I would have a very little self control around this galette. We just bought some cherries at Fred Meyer yesterday, so maybe they will end up in a galette :).